England captain Alastair Cook is to be rested for the tour match against Mumbai A beginning on Saturday, with vice-captain Stuart Broad taking over. 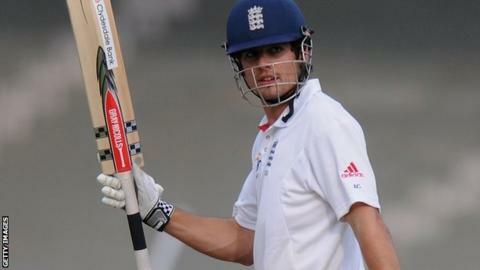 Cook scored a century against India A, a match Broad sat out. Joe Root will take Cook's place at the top of the order, with Jonny Bairstow keeping wicket in place of Matt Prior. Eoin Morgan will also play, ahead of the first Test of the four-match series against India which begins in Ahmedabad on 15 November. Both Cook, Prior and Graeme Swann, who is also rested, are expected to return for the final warm-up match against Haryana. Bairstow had been struggling with a thigh injury and, while his fitness will come as a boost to England, doubts remain over fast bowler Steven Finn, who suffered a thigh strain in the first warm-up match against India A.
Scans showed no serious injury but there is concern Finn may not recover in time for the first Test. "We're going to have to play it by ear and see how he responds to treatment," Cook told BBC Sport. Uncapped Nick Compton opened the batting for England in the draw with India A, but the Somerset man could only manage a three-ball duck. Yorkshire's Root is another option to open alongside captain Cook in the Test series. "Clearly we haven't chosen who is going to open the batting (in the first Test) and they both have another chance to impress," added Cook. "It is cut-throat and over the next few days we will know more." Off-spinner Swann said it was important all the squad featured at some stage in the three warm-up matches before the first Test. "We have a big squad so the beauty of the three warm-up games is that it allows everyone to get some time in the middle," he told BBC Sport. Asked about Kevin Pietersen's return to the England side against India A earlier in the week, Swann said: "The dressing room is getting along famously and that's what's important on a tour like this to India." Swann confirmed that he is over the illness which left him feeling low earlier in the week. "It's like I had been set upon by a gang of youths with baseball bats," he added. "But I'm over that now so that's good."